Taste: We reviewed some of the patterns in the new Knitty. Caffeinated: Abby has gotten hooked on the TV show Breaking Bad; Ben is watching Oz. Stir: Please join Team Sasquatch for the Tour de Fleece! Bite: Our question for you: What is your learning style? Who or what are your teachers? Bite Back: We talked about how you can measure how much yarn remains from a partially used skein. Abby mentioned the McMorran balance as a handy tool in this process. Tip Jar: Abby talked about the TKGA Master Handknitter's Course, Level 1, which she took several years ago. Latte: Ben continues to work on the Bitterroot shawl, and has picked up his Paraphernalia socks again. Abby is knitting the Transition Point socks, Swing Set socks and is closing in on the end of the Orchid Thief shawlette. 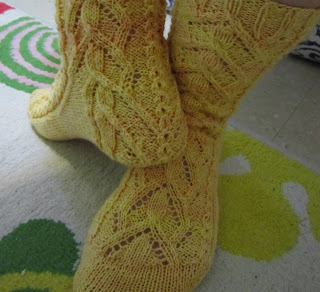 Grande: Abby finished the Marilinda socks (see photo above). Brewing: Ben is looking for some new classroom knitting and would like to make some gloves out of sock yarn. Abby recommended patterns by Julia Mueller, which might be called the glove equivalent of Cookie A's socks. Ben also wants to find a way to support or stiffen a knitted brim on a hat. Abby mentioned Debbie New's book Unexpected Knitting which features, among other things, a seaworthy knitted boat, as a place to find unconventional textures and "hands" in knitting. Stir: We invite you all to join Team Sasquatch. The dates for Tour de Fleece are July 2nd through the 24th. In preparation, everyone should pick a goal/project, prepare your fiber (if necessary), spin a one ounce sample, if applicable, and make sure all of your equipment is in good working order and accessible. Abby also recommended her favorite timer app, Kitchen Timer for Android. When time is up, you hear a rooster crow! Taste: Abby raves about Teva Durham's new book Loop-d-Loop Lace. If you have any interest in knitting lace, run, don't walk, and get your hands on this book! Caffeinated: Ben has been playing a "table top RPG" based on the Dresden Files books. Tonight he (with help from his girlfriend) is preparing a sumptuous Southwestern themed meal including nachos, meat and vegetarian fajitas and for dessert: flan! News: Abby and Ben will be featured in a future interview episode of the Knitajourney podcast with the amazing Susan. If you don't listen to this podcast yet, you should! Latte: Ben is working on the Bitterroot shawl and has also started making miniature sweaters out of sock yarn. We talked about other knitters who have made amazing miniature items, including Althea Chrome, whose knitwear appeared in the movie Coraline. You can find here website here. Abby continues to knit Cookie A's Marilinda socks, Swing Set, Vonica and has picked up an old UFO, Cerisara. 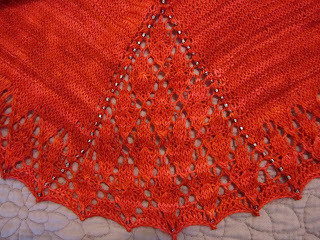 She's also cast on The Orchid Thief shawlette by Ysolda Teague and Transition Point socks from the Rockin' Sock Club. Brewing: Abby could not get gauge on Vesna with her yarn of choice and has thus abandoned that project for now. Ben is in the design stages for a cardigan with cables, set in sleeves and a shawl collar. Take a Bite: We invite listeners to submit questions for discussion and/or answers from Ben and Abby. Demi Tasse: Ben recommends some books for those who want to get excited about and read about history. They are The Devil in the White City, I Claudius and Claudius the God, and A People's History of the United States. Abby also recommended the magazine Mental Floss which studies the history of food in the current issue. Stir: We are joining Team Sasquatch for the Tour de Fleece. Abby suggests you plan your project and make sure your wheel or other equipment is in good working order. Please join the Team Sasquatch Ravelry Group here! BTW, you don't have to be a spinner. Knitters, crocheters and others are welcome. Just set a goal. If you want to learn to spin, that, of course, is a very worthy goal! Ben's tip is to try something new or challenging on a small scale. Knitting for babies and children is one option. Knitting miniatures might be another! Latte: Ben is knitting the Bitterroot Shawl. Abby continues to work on the Marilinda socks and Vonica. She has also begun Swing Set socks. Grande: Ben finished the He Said She Said Cowl; Abby finished the Elektra shawl (see photo above). Brewing: Abby wants to cast on Vesna but is not sure about her yarn choice, or whether or not to use beads. Caffeinated: Ben is excited about watching The Shadow Line, and Abby is enjoying her virtual trip to Seattle while watching The Killing. We ask: Has the way you watched TV changed with the new technology? Has this changed what you watch? Demi Tasse: Abby is excited about the newest yarn and patterns from the Rockin' Sock Club. This much seed stitch she feels she can handle!